The Archipelago of Lakshadweep has some 36 islands which are 200 to 300 kms off the coast of Kerala. Out of these 12 are atolls, 3 reefs and 5 submerged banks. There are 10 inhabitted islands and 17 uninhabited islands . the Lakshadweep islands are located between 8 degrees - 12 degree 13'North latitude and 71 degree -74 degree East longitude They are the extension of the Maldives chain of islands. Of the 36 islands the ten islands namely: Andrott, Amini, Agatti, Bitra, Chetlat, Kadmat, Kalpeni, Kavaratti, Kiltan and Minicoy are inhabited. The Lakshadweep islands are the smallest Union Territory under India and the only coral Islands of the nation. Majority of the population , about 90% of them are Muslims and belong to the Shafi school of the Sunni sect. Majority of the populace speak Malayalam, the language of the nearby state of Kerala while those in the island of Minicoy speak Mahl, the language of Maldives. Fishing and production of copra and coir are the main industry in this island country. Tourism is just gaining ground. History - The island was first occupied by sailors from Kodungallur or Cranganore who were ship -wrecked after they went in search of their king Cheraman Perumal who left on a pilgrimage to Mecca secretly. In the 7th century a Muslim saint was shipwrecked in the island of Amini. He propagated Islam in the islands and he was buried in Andrott after he died. Though the whole population was converted to Islam , the Hindu Raja of Chirakkal ruled it. In the 16th century ,the Muslim ruler of Kannur took over it and later the Tipu Sultan in 1783. After the defeat of Tipu Sultan by the British the islands were annexed to the British East India Company. After independence the Union Territory was constituted in 1956. Only five islands are now open for tourists in Lakshadweep out of which four are for Indian Nationals and two for foreigners. Kavaratti, Kalpeni, Kadmat and Mainicoy are open for Indian Nationals. This is the Administrative capital of Lakshadweep Kavaratti is the most developed of the islands with the highest percentage of non-islanders as residents. Fifty- two mosques are spread out over the island, the most beautiful being the Ujra mosque. A well, within its precincts, is believed to contain water of curative powers. The Ujra mosque has an ornately carved ceiling. Kavaratti also has an aquarium .There is a glass bottom boat for viewing marine life and an array of remarkable coral formations that provides a background to the lagoons and the islands within them. Some Water Sports like Kayaking Canoeing and Snorkeling are available for tourists. It has rich coral and marine life. Kalpeni has three uninhabited satellite islands, all surrounded by an immense lagoon of spectacular beauty. Koomel, the gently curving bay where the tourist facilities are located, directly overlooks Pitti and Thilakkam, two of the islands. Here one can swim, reef -walk, snorkel or use water sports equipment like kayaks, and sail boats. Tourists can stay on the island in privately managed huts, depending on the package. This lagoon is specially rich in coral life. It has a fine beach. A particularly fine lagoon, of even depth and an endless shoreline, perfect for swimming, It is the only island with lagoons on both eastern and western sides. A Water Sports Institute providing water sports facilities has been set up in Kadmat. Accommodation consists of AC and non AC tourist huts aesthetically situated in the coconut palm groves on the beaches. The island is becoming increasingly popular for honeymooners. A Scuba Diving Centre has been set up there. This has one of the largest lagoons in the Archipelago. Furthest from Kavaratti island, 200 Km. away to the south and also nearer to the Maldives, Minicoy has a lighthouse built by the British in 1885. 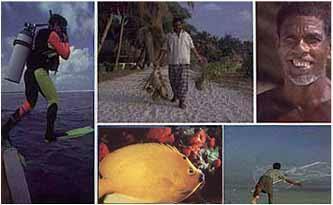 Minicoy has a culture very different from any other island - dress, language, food, all differ. It has beautiful lagoons and the airport is situated here.This is the gateway to Lakshadweep. This is a 6km by10km lagoon with three small islands of Thinnakara, Panali- 1 and Panali -2.This uninhabited island has over 128acres with good beaches, catamaran rides, kayaking, snorkeling, scuba diving, deep sea fishing, etc. Tear-drop shaped, it is encircled by a continuous halo of creamy sand., each easily accessible by outboarding, sailing rowing and for the athletic, by kayaking or wind-surfing from Bangaram perfect for a day's outing. The exquisite coral formations including the black coral formations, the large variety and number of coral fish-the angel, the clown, the butterfly, the surgeon, the groupers sharks, mantarays, sting rays, moray eels (morena) and turtles, make diving here an addictive experience. There are Lakshadweep information centers in Kochi and Delhi. Air -Indian airlines flight connects Agatti with Kochi in Kerala daily except for Sundays. 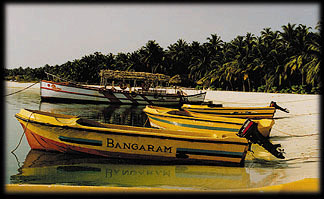 Sea - There are regular boat cruises to the islands for Indian nationals .The Island is not open for individual tourists. Scuba diving classes are held here both for beginners and advanced learners by Laccadives in Kadamat. Life under the sea is explored here. Deep- sea fishing is allowed here. Glass bottom boat trips are available for excursions to nearby uninhabited islands and for snorkeling. Tour packages are available for Indians from Kochi by sea. The Kadamat Beach Resorts and Water Sports Institute conducts tours from Kochi to Kadamat for both foreigners and Indians. Facilities for snorkeling and other water sports are available. Agattti Island Beach Resort- This is for Indians only. Independent cottages are available for accommodation. Boat trips into lagoons, snorkeling and other water sports are available here.